DCS Grill Burner. Free Shipping. DCS replacement bbq parts new burner stainless, cast iron, infrared. Dynamic Cooking Systems, DCS model BBQ grills have changed many times through the years. Older DCS gas grills used cast iron burners because they were thick, strong and conducted heat necessary for searing temperatures. 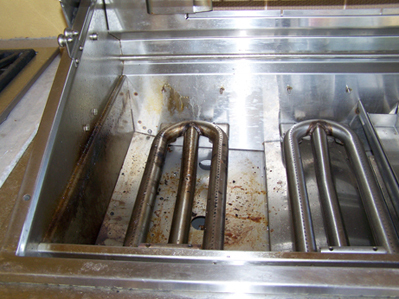 Newer DCS grill parts were all 304 stainless steel and stainless steel burners last longer without the weight and rust common to cast iron. 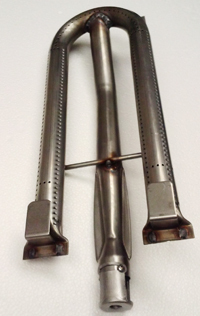 When the change to stainless steel burners was made, DCS also pioneered the use of porcelain rods to conduct heat instead of lava rock trays used by older model barbeque grills. Rotisserie burners were added using the emerging infrared technology that generates enormous heat quickly and dedicated smoker tray burners added. Fits Models: 27DBQR 27DBR 27DSBQ 27DSBQR 27FSBQ 27FSBQR BGA27-BQ BGA27-BQR BGB-30 BGB-36 BGB-48 BGa-48 Stainless steel burner replacement fits DCS gas grills. Stainless steel gas DCS burner will fit any DCS gas grill of the newer models that use stainless instead of cast iron burners. DCS barbeque burner clips in the back and mounts by sliding over the orifice at the control valve in the front control area of the DCS barbeque grill. Total length is slightly longer than 19 inches. Six inches wide. Stainless steel center feed U burner sold by DCS as a replacement part for the BG, BGA and BGB model DCS gas grills. Also known as 212362. Replacement burner for BGA 26 gas grill models by Dynamic Cooking Systems barbecue grills. There was only one 26 inch DCS gas grill and this is the only barbecue manufactured for grilling without lava rocks, briquettes or porcelain rods for radiant heat conduction. Burner Size is 17 3/8 inches long and 6 3/4 inches wide. The burner looks just like larger model burners except there is not a cross over tube across the base of the burner. The center feed tube is lower than the sides and shields at the ends of the U collect gas for the igniters. There are two installation tabs at the end and an air-shutter at the front venturi tube. Stainless steel DCS burner. Gas grill parts for smoker burner in DCS 36" and 48" gas grills. 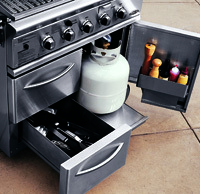 This stainless burner fits any DCS gas grill with a pull-out wood smoker tray. The dedicated barbeque burner allows you to heat wood chips without using the grill burners and generating too much smoke for slow smoking. Fits Models: 27 27 series 27ABQ 27ABQR 27BQ 27BRQ DCS grill parts - cast iron DCS gas burner fits 27" DCS gas barbecue grill. Although the 27" model of DCS grills has been discontinued replacement grill parts for the grill are available. Heavy cast iron grill burner. Replacement Cast Iron Burner for DCS 36/48 BBQ Grill Models is 20.5 Inches long and 6.25 Inches Wide. Large Cast Iron Burner casting is designed to support the lava tray above the burner and the burners ship with air-shutter for clean burning adjustment. Free Shipping Continental USA!! Burner Details. Infrared rotisserie burner for DCS grill. This infrared rotisserie burner is for 27 and 48 Inch models of DCS gas grill. Measure your rotisserie burner and it should be about 16 Inches across. The older Dynamic Cooking Systemns infrared burner was in the back panel of the 27 models and the 48 models that have two rotisserie burners. The DCS 24" model has a different burner design than any other DCS gas barbecue grill ever made. There are two replacement burners. This item is the front burner that runs left and right along the front of the grill. On the far left side this stainless steel burner turns forward for the venturi to attach the the control valve and on the far right side the burner attaches to the second burner. 2223 DCS 24" model back burner has a ninety degree curve to burn along the right side of the barbecue grill and the back of the BBQ. The fron of the burner fits over the orifice in the tip of the control valve. The older DCS 24 model gas barbecue grills have a very different burner design. The two burners attach to the two valves in the front control panel of ther BBQ grill and mount sideways inside the barbecue grill. In the image above the burners are laid out in the same way they will install into the DCS 24 gas BBQ grill. Propane fireplaces and fire pits always have to have a pilot kit with a thermocouple and safety valve that is capable of automatically turning off the gas flow if the flames are out. Ring burners can be wide open inside but we get better flame patterns using multiple rings in the same burner. The biggest mistake people make is not getting a small enough burner. When the burner is too big the outer structure can be easily discolored and damaged. The new Fischer and Paykel version of DCS did not make any real waves in the world of grilling when they came out with the Liberty Collection of barbecue grills and accessories designed to take over the custom outdoor kitchen industry.